Renee Fleming's rendition of "Danny Boy" at Senator John McCain's funeral last year put the ballad back in the public ear. Just hearing it sung by a woman, instead of a male tenor, made it newer, brighter and thrilling again. 1. READ THE LYRICS AS STRAIGHT TEXT AT THE FUNERAL. DON'T HAVE IT SUNG AT ALL . Just calmly read all four stanzas aloud from the podium—for the pure poetry—and watch people reach for their handkerchiefs. To read it aloud is to realize that many of us haven't been listening to the words! Oh Danny boy, the pipes, the pipes are calling, from glen to glen, and down the mountain side. The summer's gone, and all the flowers are dying, 'tis you. 'Tis you must go, and I must bide. But come ye back when summer's in the meadow, or when the valley's hushed and white with snow. 'Tis I'll be here in sunshine or in shadow, oh Danny boy, oh Danny boy, I love you so. And if you come, when all the flowers are dying and I am dead, as dead I well may be. You'll come and find the place where I am lying, and kneel and say an "Ave" [a prayer] for me. And I shall hear, tho' soft you tread above me. And all my dreams will warm and sweeter be, if you'll not fail to tell me that you love me. I'll simply sleep in peace until you come to me. 3. JETTISON THE MALE TENOR and use a different sort of singer. Women have been singing "Danny Boy" beautifully since soprano Elsie Griffin belted it out at the turn of the century. My personal favorite female-rendered "Danny Boy" is Sinead O'Connor's. But teen grandkids can potentially become the most sincere and delicate funeral talent, tenderly singing "Danny Boy" at a grandfather's funeral (though funeral music should always serve as an “offering,” and not a perfect concert performance). 4. 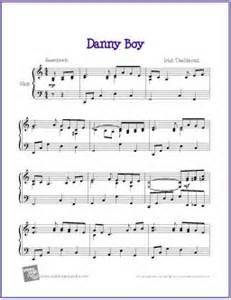 FINALLY, CONSIDER EMPLOYING A MORE UPBEAT "DANNY BOY" AT THE FUNERAL'S CLOSING. This idea might not be everyone's pint of tea (or Guinness), but imagine "Danny Boy" played on sprightly banjo, after all concluding remarks and benedictions, as people are hugging, warmly greeting each other, finding their coats, blowing their noses, and remarking what a good funeral it was (Irish or not). Moral: it's okay for a funeral to leave people uplifted and grateful that the dead were with us for as long as they were, happier themselves to still be alive, resolved to make good use of whatever time is left.